A recent survey revealed the top 5 essential skills and qualities needed for those in leadership roles. Some say leaders are born. 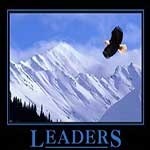 I think leaders can be developed if they are committed to developing the skills needed to become a good leader. Leadership skills are a valuable asset for someone looking to move up in an organization. “Leadership” is often seen as the role of upper management. In fact managers have management leadership roles. Their reign of influence is not as vast as upper management, but the skills needed to lead at the manager level are similar. Most of those in upper management positions were once managers. So learning these skills will not only make you a better manager now, but they give you the skills needed to take on a leadership role in the future. Communication skills ranked highest by most respondents and another recent survey of recruiters ranks it as one of the more decisive skills when a company hires a manager. To be a great leader or manager, you must be a great communicator. Communication skills can be broken down into three areas. Leaders need to clearly communicate their message each day. Both the sender and receiver must have a clear understanding of the information that results from the communications. This means you must be able to convey your thoughts and ideas effectively. Common mistakes in speaking are the message is too long or unorganized. Your communications must be short enough to not lose the attention of the receiver and organized so it is clearly understood. It is important in one-on-one communications to ask for feedback to ensure they understand what you are communicating. A common complaint in many organizations is “My boss does not listen to me”. It is important when someone is speaking to you that you give them your full attention. When someone comes to your office to speak with you, put down everything you are doing, turn to them and give them your full attention. It is important to ask questions from the speaker and to be sure you have a clear understanding of what they are communicating. The speaker may not be skilled in communications so you may need to pull out clarifications of key points to make sure you understand the message. “So what you need is …”, “So I understand this …”, “So what you are telling me is ….” are examples of clarifications. Emails, memos and reports are all forms of written communications skills. They can be a very effective and efficient means of communications provided they are done correctly. One of the biggest complaints about written communications, in particular email is too much information is given. Apply the KISS (Keep It Simple Stupid) principle to all forms of written communications. In most instances you should be able to communicate an email message in three to five sentences. For more information read the two articles in our Leadership Skills series, Leadership Skills Communications Part 1 and Leadership Skills – Communications Part 2. As a leader you must be able to set goals and determine priorities that lead to results. Leaders who produce results not only drive value to the business, but increase their value to the organization. You need to have a “can do” attitude about showing results. To be results oriented you must first know what the expectations or goals are. Once you know this you need to lay out a plan to reach the goal or the desired results. You are at point A and need to get to point B. Your plan should have specific steps to reach your goal. This type of planning with an action oriented, can do attitude and with constant communications and feedback with those involved will yield results that show you can lead. You should use SMART (Specific, Measurable, Achievable, Realistic, Time-framed) goals. Specific – clear about what, when, where and how on your goal. Measurable – goals must be measurable so you know your progress and when you have reached them. Achievable – goals should be ones you know can be achieved. Realistic – goals must be realistic. While you may think you can do anything it is important that you do not set goals you can not do or you lack the resources for. Time-framed – goals need to have a time frame. A clearly set start, with milestones so you can measure progress and a end for the expected results. Leadership is often defined as “The ability to influence a group’s behavior, attitudes and actions toward the achievement of goals”. Good leadership skills include the ability to inject huge doses of enthusiasm into a team or individual, and be very energetic in driving others forward. Leaders need a vision and to be able to clearly share that vision with others. Leaders must delegate responsibility, but must be accountable. Leaders must be able to influence others, not by rules or force, but by persuasion. Leaders establish a direction and align others to reach a common goal. While leaders are often defined by actions and behavior, their personality is a key part of their leadership. Leaders should be driven towards excellence not just in themselves, but in others as well. Leaders are innovative and challenge the status-quo. Leaders ask what, when, where and why. Leaders have an eye on the horizon and have a long term perspective. Leaders focus on the people and inspire trust. For IT projects and initiatives to succeed teamwork is not only vital, it is a requirement. Team oriented leadership delivers results by building a team of people with diverse skills to complete the task. A team oriented leader must reach out to others who can give help and bring them on-board to meet a common goal. Nobody is an island and no leader is successful without being committed to teamwork. It is not about the person and should include others in the decision making process and the implementation of processes and procedures. It is about organizing, supporting and being an active participant. Leadership itself is about teamwork. Not standing on the hill and directing, but getting down in the trenches and helping others get the job done. Words are not enough. Leaders who show active participation help build trust and confidence in the team which leads to the overall success of the project or initiative. Teamwork should be a company wide philosophy. Read the article One Company, One Team – How To Deal With “It’s Not My Problem” for a better understanding of how important teamwork is to the company and to each person. It was once thought the art of persuasion was only needed by people in sales. IT leaders must often “sell” their ideas to others and having the skills to do this can be the difference between success and failure. If you have a project or initiative you want to be successful it will take the help of others and often these people must be persuaded to give you the help that is needed. Influence and persuasion is not using fear or threats to get what you need. It is not using your authority to demand something be done. It is often a give and take situation, much like a negation. It helps to be a charismatic leader, but a reputation of achieving results can help get others on-board so they help and share in the success. You do not have to be part of management to be in a position that requires leadership. Teams have leaders, projects have leaders, work groups have leaders. In situations where no clear leader has been appointed one can step up and take on a leadership role to help drive a project or initiative to success. i am trying to develop leadership qualities, this article is helpful. I would love to develop leadership skills, the article has been of great inspiration to me and it gives me space to assess myself in order to know what i lack in this area. Leadership skills are important for managers because good managers are also leaders. The people most likely to rise to leadership positions are managers who over the years have perfected both their management and leadership skills. Great tips – I hope to move into a leadership role at some stage and these are things I’ll need to remember and learn. what are the roles of leadership and management skills in environmental health sciences?